Tiny Love 3-in-1 Cozy Rocker Napper - - New! Free Shipping! Amazing Features!! Easily converts from seat to cozy napper Soothing movements rock your baby in all 3 reclining positions Adjustable canopy helps create a serene, cozy environment Flat pad (180°) with raised borders offers plenty of comfort Electronic toy with adorable soft toys engages and amuses baby 1-3 months Quiet time alone is important for baby's development. 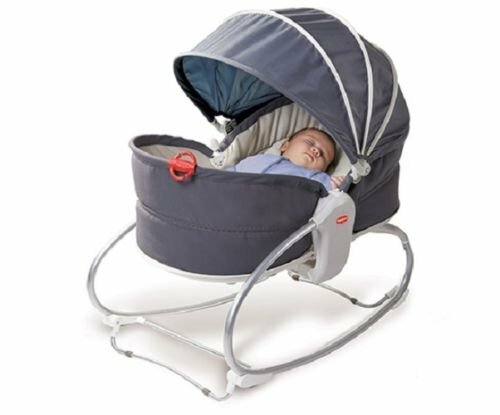 Let your baby enjoy the gentle rocking movement of the 3-in-1 Rocker Napper while gazing at the musical electronic toy. 3-6 months Move the Rocker Napper's hanging electronic toy to the appropriate distance from baby's palm, so that when she raises her hand she can hit the toy or, later, grasp it with ease. 1-6 months About a fifth of all babies suffer from colic. The 3-in-1 Rocker Napper's vibrating movements could help babies' immature digestive system and ease their discomfort.